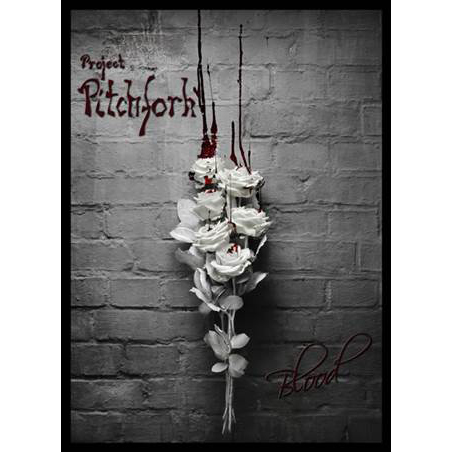 German Import – What is left to say about Project Pitchfork? About a band responsible for an entire genre and hordes of epigones and that yet was never willing to give up the throne? Is not the sheer mass of classic anthems that already lure the second generation of Dark Electro disciples onto the dancefloors worth more than that? Is not an anecdote like the one of Project Pitchfork having taken – years ago – a certain band called Rammstein as their tour support weighing more than every single word? Well, perhaps there is something left to say after all. This, however, is only due to the fact that Peter Spilles never tires of reinventing himself, his project and his sound, never stops to reflect his art and never gives in the temptation to rest on his laurels. Transferring this abstract drivel into music is once again done with Blood. No call to arms, no tiresome exaggeration of ridiculous extremes. 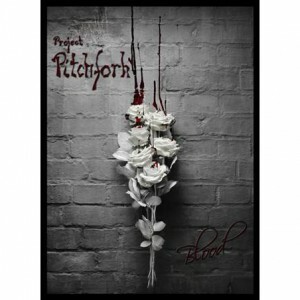 No, Blood is nothing short of a hardened proof that every revolution is bound to shatter on this stronghold called Project Pitchfork – and this even holds true after more than 20 years. We have blood on our hands. Nothing new in times like these, one might day, and yet insistently brought to the surface with Blood. The equally simple and effective title is the recurring theme on this record and at the same time prefix of each and every song title. The tracks are called “Moon“, “Loss“ or “Money“, pretty ordinary words on their own account, that only show their full meaning when joined with the album title. Blood as currency, blood as the dominant factor result in a bloody march against injustice, war and oppression, in an electronic catalyst for more self-determination. Blood is much more than just another record from a well-oiled machinery. Dark, menacing, driving and anthemic like so often before, Project Pitchfork manage to deliver the next surprise after Black: An interlocked, carefully thought-through and infernally powerful album that will cause one thing on the dancefloor above all others: bloody feet. -Strictly limited to 2000 copies.